Tie 1 On! Bag Pattern is an easy to make quilted tote bag with instructions (and templates) for 3 tie-on charms! 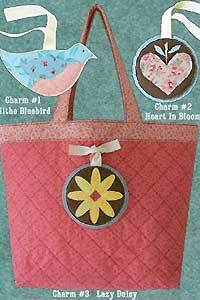 This tote pattern also has instructions for 2 large inside pockets and the charms can be used as gifts or luggage tags. Finished size for the tote is 13" H x 19" W x 6" D with a 10" handle drop. Finished charm sizes are 5" x 5" for the round charms and 3 1/2" x 6" for the bird charm.